In the end, after all the fanfare, the announcement by the Labour Party of how and why they were going to cut tuition fees to £6000 remained what it always was. A sneaky, piece of short-term political opportunism making no economic sense that is purely about stealing votes from the Tories and Lib Dems and nothing about improving this country’s long-term future. That Ed Miliband decided he had to explicitly claim that there was no way that he would be giving up the policy in coalition negotiations made it even more so. The fact that he had to use such mendacious language in addition to describe how they work makes it even worse. Politics should be better than this. 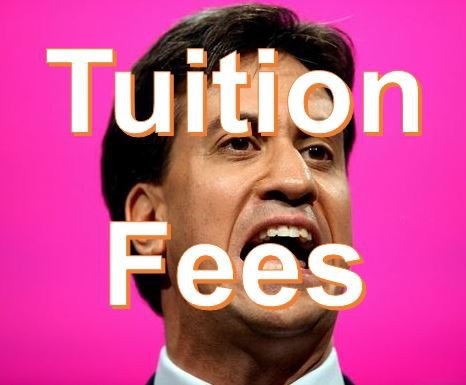 Put simply, if there really was a moral case against tuition fees, then Miliband and Labour should have abolished them. The truth is though that every metric on which their success had been measured showed that if they are going to exist, they need to be set at a level that achieves what they set out to do. At £9000 a year, that money was providing no excuse for universities to not improve their provision. That they were paid out to universities at the beginning of each year meant they got the money when it is needed. At £9000, the money from those who benefitted most from university funded grants for those who can’t afford it. Universities were receiving 20% MORE applications from poorer students than every before, and giving more places to them too. The ability of universities then to offer as many places to students with ABB grades as they could fit was providing an incentive onto improve their product without submitting higher education to the price mechanism. So, there was nothing to be gained from cutting the fees in terms of the overall aims of the scheme. Or, put another way, there isn’t a single problem that Labour is solving with this policy other than how Ed might more likely be Prime Minister. Which is again why Miliband using the word “debt” to describe the situation students face when they leave university was so mendacious. Students pay nothing back unless they earn more than £21,000, which means their education is completely free unless they are no longer poor. They then pay 9% of everything they are paid over that amount until they have paid their fees off. So someone earning £25,000 would pay about £30 a month. Hardly a drag on their living standards, but certainly a contribution to a major factor in them achieving that wage. Under Miliband’s scheme, the ONLY people who will benefit are those with starting salaries over £35,000, because only they, assuming normal salary growth, will earn enough to pay the final portion (£6000 to £9000) of the fees, and now won’t have to. So, the ‘progressive party’ have produced a policy that benefits bankers most. Well done. Labour claim that they will fund the drop in fees by abolishing pension tax relief on those earning more than £150,000 a year. Nice, bit of rich-bashing to go with it, helps the politics you see. But those people will simply save less into pensions and put their money into somewhere more tax efficient. Labour will increase the interest on tuition fees on those earning more than £42,000, which is progressive yes. BUT, both incomes go straight to the Treasury, NOT to universities whereas at the moment all £9000 a year is guaranteed to go to universities. So there is no guarantee that this won’t affect the quality of university provision. It also puts the universities back where they were, reliant on the beneficence of the State for their funding, not their students, which means they will need to respond once again more to the needs and demands of the state, not their students. What do you think the result of that might be? Ultimately, should a shortfall arrive in the long-term, the taxpayer will have to fund it. That means money taken from the health, state education and Sure Start budgets to pay for young people to increase their earning power in the future, for which they now have to pay less. It is very simple, if you want to help improve social mobility you should spend a lot more money on early years education, so everyone, from whatever background, can read, write and add. Is putting that at risk really sensible long-term policy making? Or that that Ed Miliband trying to sneak in a few extra seats in May, by helping 18 year olds, who can vote, ahead of two year olds, who can’t? I know what I think. Which leads me to my main point. If Miliband and Labour really believed in what they were saying. If they really believed that tuition fees were the young being bashed in order to fund the lives of the old. If they really believed that a higher education for all benefits everyone in the country as we have more Doctors, teachers, scientists etc then they should have abolished them. But they didn’t, because they can’t. Because they have worked, and they are fair, and they are only asking people who have actually financially benefitted from their university education to contribute towards it. The real issue at stake here is that the New Labour “widening participation” agenda went too far. It encouraged everyone to go to university regardless of whether it was the right choice and undervalued the vocational pathways that could lead to rewarding trades. Much research has been done on the amount of “graduate-level” jobs needed in a developed economy and it is about 33%. In Germany, where the education system, training and qualifications required gives vocational and trade pathways proper prestige, the result is a country with a higher GDP per capita yet far more equal income. You would imagine a social democratic Labour Party might want that. But oh no, there’s an election to sneak a win in. « Fixed Term Parliament Act and chaos. One may begat the other.